Do I need a permit to put a roof or siding on my house? No, the Village of Minooka does not require a permit to put a roof or siding on a house. Can I receive a discount on my water bill if I have a pool or if I fill my pool? No, the Village of Minooka does not offer any special discounts on water bills to residents with pools. Do I have to reserve a pavilion at the local parks in order to use them? Yes, the Village requires a reservation and a cash or check deposit before using the park. The deposit is $50 for residents and $100 for nonresidents. This deposit can be refunded after the party. Can I pay my bills over the phone? No, the Village of Minooka does not accept bill payments over the phone. 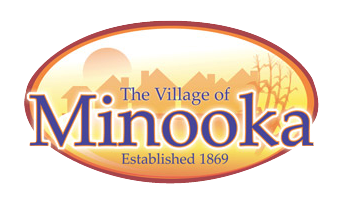 What are the office hours for the Village of Minooka? The Village’s office is open from 8-4:30 Monday-Friday. What do I need a building permit for? Where can I find the building permit? Residents need building permits to build sidewalks, driveways, decks, pools, fences, and any additions to the house such as a garage. Click here for more building information. When will the dead trees be replaced in my parkway? The trees will be replaced as soon as funds are available. Is the Community Room available for parties? No, only non-profit groups can meet in the Community Room. Who should I contact if I have a question on my tax bill? Residents should contact their local county assessor’s office. Click here for the contact information of Grundy County. Click here for the contact information of Will County. Click here for the contact information of Kendall County. Who should I contact for my Special Assessment information? All inquiries can be referred to David Taussig & Associates Inc. They can be reached by the phone at (800)969-4382 or (949)955-1500. Where can I get my tax exemption certificate? Click here for the tax exemption certificate. Where do I find the village ordinances? Where can I find local job opportunities? How do I contact the village? Where can I find a job through the village?